Saturday afternoon is your last chance to catch a Seattle U men’s soccer game this season. The Redhawks are looking to end a less-than-stellar season on a positive note against CSU Bakersfield at Championship Field on 14th and Cherry. Game time is 1 p.m. A pre-game ceremony will honor the team’s six seniors. SU’s volleyball team plays at the Connolly Center North Court Friday and Saturday night (vs. CSU Bakersfield), and again next Thursday (vs. Portland State). All three games are at 7 p.m. Thursday’s game is the final home game of the season. Late on this one but we’re guessing a few teams might still need players. A new Seattle gay bowling league has started. Not bowling on-Hill, however. At Sun Willows Golf Course in Pasco on Saturday, Northwest’s Maddie Meyers will try to win her fourth state 1A cross country championship. More than likely the record-breaking Meyers will qualify many more runners to join the Maddie Meyers Beat Me Facebook Group. Meyers races at 10:30 a.m. Seattle Prep’s boys x-country team, ranked #2 in the state, will try to knock off #1-ranked North Central of Spokane, which has won the last five state championships. The 3A boys race at 2 p.m. If you want live results you can get them via the WIAA Twitter feed. O’Dea and Seattle Prep both play in the loser-out “Week 10 state football playoffs this weekend. 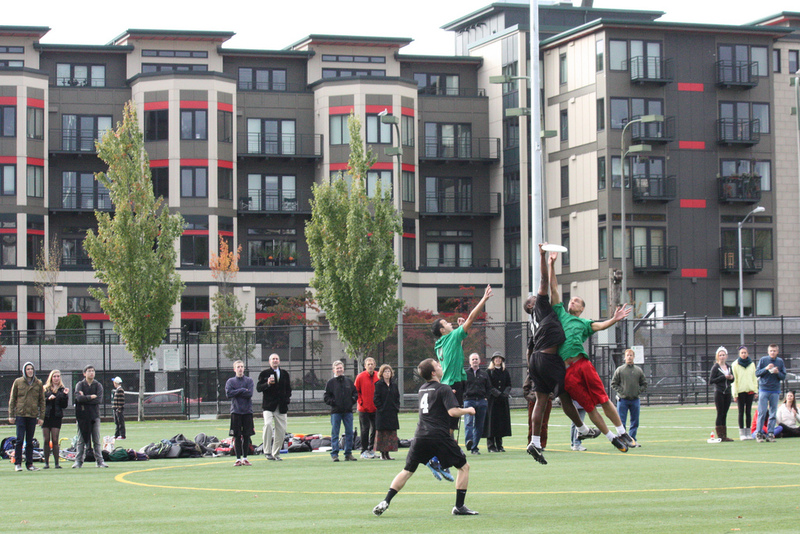 Both games are at the schools’ official “home field on the grounds of Seattle Center, Memorial Stadium. Seattle Prep plays Timberline Friday at 7 p.m.; O’Dea plays Mount Vernon Saturday at 4 p.m. If you’re in the area (possibly for Saturday’s Hmong Festival), swing on over and support the local boys. Congrats to Northwest School’s Ultimate Frisbee team, winners of the USA Ultimate Washington High School Championship — pictured on this post in a Halloween day battle with Franklin. What’s Playing at Cal Anderson (a.k.a. Bobby Morris Field)? This entry was posted in Uncategorized by Seth Kolloen. Bookmark the permalink. Congrats Northwest School on your victory.